The village of Tobermory, originally a lumbering and fishing community, is located at the northern tip of the 77 kilometers long Bruce Peninsula. Today, Tobermory is home to two National Parks, the Bruce Peninsula National Park and the Fathom Five National Marine Park. 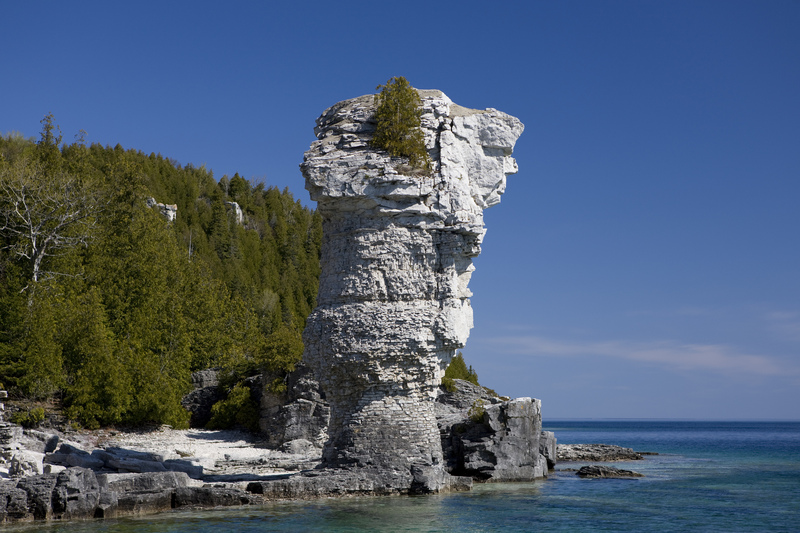 Flowerpot Island is part of the Fathom Five National Marine Park and is famous for the two rock pillars, or sea stacks, on its eastern shoreline. There are 4.3 kilometers of walking trails and miles of pristine, limestone shoreline – perfect for picnicking, sunbathing and swimming. Our Jet Boats or Glass Bottom Boat Tours will set you down at Beachy Cove if you opt to do some exploring. Alternatively, you can choose a scenic stay aboard cruise and simply take in all the highlights from the ship. 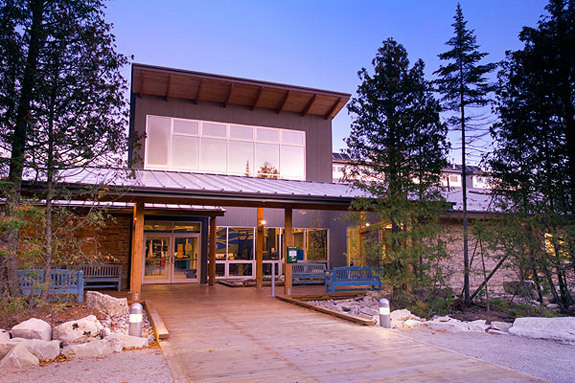 Located in the village of Tobermory, the Parks Canada Visitor Centre is open daily from early May to late October. Their knowledgeable team provides detailed information about the two National Parks. There is also an excellent exhibit hall that is a must-see for all who want to understand how Tobermory and the Bruce Peninsula earned its UNESCO World Biosphere designation. Take time, as well, to climb the observation tower for a stunning view of the islands off the coast. Renowned for the dramatic cliffs that tower above the beautiful clear waters of Georgian Bay, the Bruce Peninsula National Park also comprises great tracts of unspoiled forest – home to bears, beaver, foxes, squirrels and abundant bird species. Rare reptiles, including snapping and painted turtles and the Massasauga rattlesnake, are found throughout the many wetlands and alvars. On a clear night, the brilliant starry sky, bedecked by the Milky Way, demonstrates how our area earned its designation as a Dark Sky Preserve. Whether viewing from a campsite at Flowerpot Island, during a guided hike at Singing Sands, or star-gazing on the MS Chicheemaun, prepare to be awed. Located on the Lake Huron side of the Bruce Peninsula, about 8 kilometers south of Tobermory, Singing Sands offers trails through a delicate ecosystem first protected by the Federation of Ontario Naturalists. It is home to rare plants including the delicate northern Calypso Orchid and several species of frogs, snakes, salamanders, and turtles. It is also a very popular, family-friendly swimming location with the longest sandy beach on the upper peninsula. 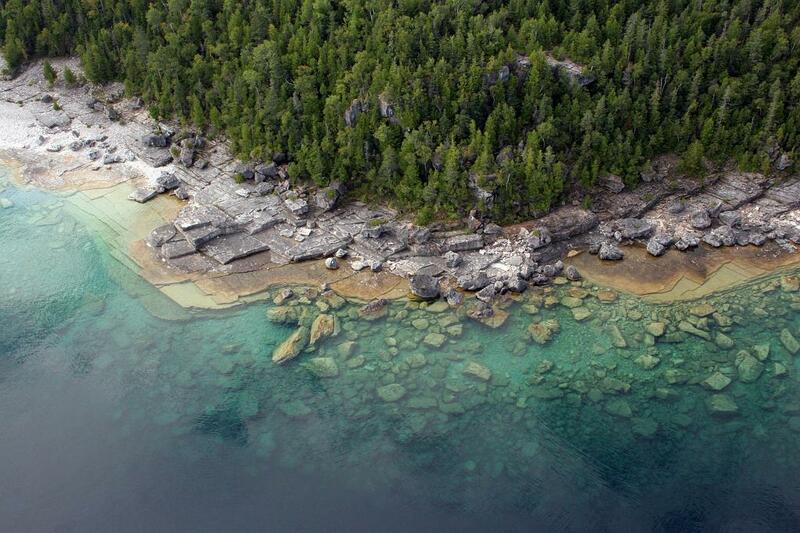 Consider catching a bird’s eye view of Tobermory, the islands and the crystal-clear waters of Fathom Five National Marine Park with Blue Heron Tours. Experience the exhilarating views of shipwrecks, underwater geography, lighthouses, inland lakes and famous landmarks like Flowerpot Island, the grotto and downtown Tobermory.